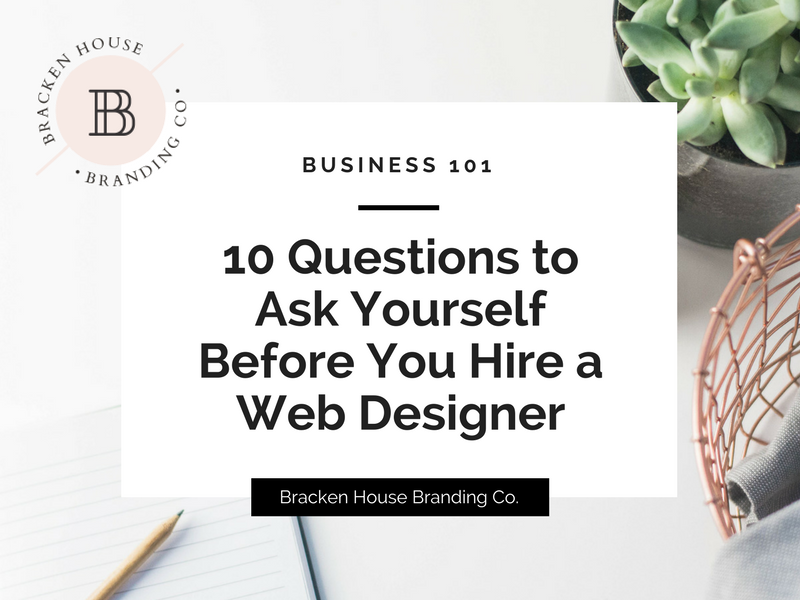 10 Questions to Ask Yourself Before Hiring a Web Designer - Bracken House Branding Co. When you’re starting a new business, or even re-branding an existing one, it’s easy to get caught up in the excitement! You’ll want to find a web designer right away, and get started. However, it’s important to step back and get yourself organized before you even start to interview designers, so you know what you’ll need help with, and can therefore have a better list of requirements when doing your designer evaluations. 1 | What is your timeline? Do you have any big interviews or events coming up in the next 3, 6 or 12 months that you need to be prepared for? If you expect to receive a lot of interest in your business, you’ll want to figure out when that will be, and reverse engineer your timeline. Plan at least 2 weeks for prep work (strategy, copywriting and photography), and another 2-4 weeks for the website design process. You may also want to factor in 2 more weeks post-launch, to be sure that there are no glitches and that everything, including your contact forms, are working correctly. 2 | Is your brand already established? Having an brand identity is the foundation of all great websites. You will need to have a logo (if not custom, a text-logo will work just fine), your colors, fonts and visual style already established before you can expect any designer to create your website. This should ideally all be on your Brand Style Guide, whether it’s something you’ve done yourself, or had another designer do for you. If you don’t already have this, many web designers will offer Brand Identity as an additional service to Web Design. 3 | What is the #1 goal of your website? When your ideal clients land on your site, what is the main thing that you want them to do? Should they click through to read more about you and your services? Do you want them to fill out an inquiry form to work with you? Or maybe you want to spend some time building your email list, so it would be really important to have an enticing opt-in front and center on your website. Your web designer will ask you what is your main CTA, and it’s important to know the answer to this so that the website is laid out correctly from the beginning. 4 | What is your Value Proposition Statement? This is that clear statement, “We do X, for Y, so they can Z”. You only get 5 seconds to make a first impression, so it’s the first statement that your audience should read when they land on your site, so they know immediately who you are, what you do, and how you can help them. Defining your VPS could take some preliminary brand strategy work, so be sure this is something you’ve thought through, and sought out help with if you’re unsure. I include this preliminary brand strategy work in my signature branding package, and would love to help you out if this is an area you’re struggling with. 5 | Have you purchased your domain and secured your social media usernames (of the same domain)? This is an easy one, but it’s probably the most important thing you need to do. Secure that domain and ALL the usernames that you’re going to need before you start. There are a few places you should check when determining your domain. First, my favorite name checker resource, www.namechk.com will tell you what extensions of the domain are available as well as what social media still has it available for a username. Once you find out that it’s available, head on over to TESS (Trademark Electronic Search System) and enter it there as well. The last thing you need is to spend all the time, money and effort on your business, only to get a cease and desist letter months (or years) later. Trust me, this has happened to me before, and it’s happened to some of my clients as well! 6| What other accounts do you need to set up, to run and integrate with your website? In addition to purchasing your domain name, you need to be thinking about several other accounts you need. Do you have a way to collect emails to keep in touch with your prospects? For this, you’ll need something like MailChimp or Active Campaign. Do you need a scheduling system integrated into your website? I use and love Acuity Scheduling, but there are many to choose from. If your website will be built on WordPress, you’ll also need to purchase web hosting, in addition to your domain. I recommend SiteGround to all of my clients for their web host solution. Also, if you’re going to use WordPress, you’ll need a theme. Most designers (like me) include the theme license in their service, but some do require that you buy your own. If you’ll be using Squarespace or Shopify, you will need an account for either of those as well. These are all talking points for when you start meeting and evaluating your web designer options. 7 | How many pages will you need on your website? Many designers price their services based on the page-count, so it will be important to determine early on, whether you want a smaller brochure-style site with just a handful (4-5) of pages, or if you anticipate needing something more robust with a full navigation with individual service-page drop-downs, media, faq’s, multiple gallery pages and contact forms. Whether you write this all out on a cocktail napkin, or dive into a full-scale spreadsheet sitemap, it’s important that you at least have a general idea of how your site should be structured before you start pricing out designers. If you’re feeling lost about this, a great designer will walk you through the process as part of her service. 8 | Is your website copy already written, or will you need to set aside time to do that? Most designers I know don’t write copy, and they also won’t start a project until they have all copy in hand and ready to go. It’s very difficult to design web pages without knowing the amount and style of copy that needs to go on each page. Have you already written yours, do you still need more time to do that, or will you be hiring a copywriter for this task? If you’re planning to hire it out, keep in mind that many professional copywriters have a waitlist that is 1-3 months long… When in doubt, ask for referrals! 9 | Let’s talk about photos! Do you already have professional, on-brand photos? A website without photos is just a high-tech, clickable “document”. In order to captivate your audience and compel them to read more and ultimately want to work with you, they’re going to want to see more than just words on the screen. If you haven’t already had a professional photo shoot, you’ll want to factor that into your timeline and expect at least a few weeks to hire a photographer, prepare for the shoot, do the shoot, then wait for the photos. If you’re not planning to have a photo shoot, you’ll want to assess the stock photo market, and determine which photos will best meet the needs of your website’s purpose. Stock photo selection is something that is often best left in the hands of your brand or web designer, so be sure to ask about that when looking for a designer. 10 | Are you ready to do the work? Sure, when you hire a web designer you expect that she’ll be doing all the work, but don’t be fooled. Just because you aren’t the one that will be designing the website, there’s still a lot of work ahead of you! Web design is a collaborative process, and while I’m honored that you’ve trusted me to bring this vision to life for you, I’ll still require your swift and candid feedback throughout the duration of the process. Please don’t hire a designer, then jet off to Paris for 2 weeks and expect your designer to work magic while you’re gone. No one understands your business and mission better than you do, so it’s extremely important that we work side by side in bringing your greater vision to life. Hopefully these 10 questions have given you some things to think about as you’re nearing the process of hiring a web designer! 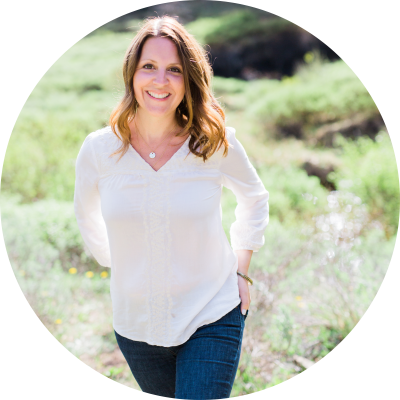 If you’ve covered everything above, and you’re ready to get started on your own beautiful web design journey, I’d love to chat with you to see if we’re a good fit.